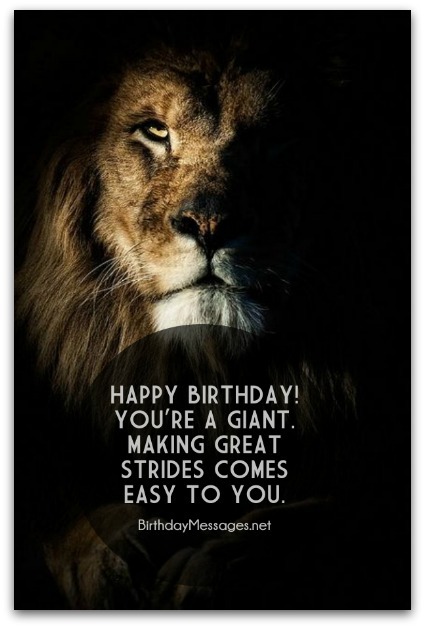 Perfect inspirational birthday wishes can inspire loved ones to make serious life changes. You'll find all the motivational birthday messages you need on this page. Each one holds the promise of a better future for the ones you love. Are you inspired to start your search? You should be. You're bound to come upon a birthday verse that's just right for your special birthday boy or girl. Alas, when you need to delve into a treasure trove of inspirational birthday wishes on the web to uncover the pearl of a birthday message, your criteria suddenly gets broader (in other words, a little more complicated) and it's harder to choose the perfect one. There are, however, certain rules of thumb that make the whole selection process easier. Rule 1: Before you give the birthday girl or boy an inspiring birthday wish, determine the specific type of message you would like to convey. General messages can be inspiring but tend to be less impactful than specific ones. And there are many ways to inspire someone. For a few suggestions, click here to check out 18 Ways to Inspire Everyone Around You, an article with great inspirational ideas for your loved ones. Rule 2: Choose inspirational birthday wishes that will be meaningful to the birthday boy or girl (not what you think is meaningful). The quickest way to turn off anyone is preaching what's important to you and only you. To see what I mean, think of all the times you've received an unwanted lecture from a friend or family member. Rule 3: Pick inspirational birthday messages that will both inspire the ones you love and, even more so, make them feel special and loved. This is, after all, their birthday (and everyone deserves to feel special and loved on their special day). This calls for inspirational birthday wishes that are also heartwarming. Whatever type of inspiration you need, you'll find it here. The inspirational birthday wishes below cover lots of ground. The bottom line? Sending a birthday message that’s meaningful, inspiring and heartwarming to the birthday boy or girl is the way to go. I know you are young now but I can already tell that you will one day be a superstar at whatever you do. Happy birthday! When I think of the world’s most amazing teenager, I think of you. May every dream you have spread its wings and fly high! Happy birthday! Today could be the start of something special! Enjoy every second of your birthday! Then, carry that joy in your pocket like spare change (so it will be there when you need it)! May life take you on a journey you never imagined, bringing you to a destination that stirs your soul, gives you peace of mind and surrounds you with love! Happy birthday! You're a total original! Never a follower. Always a leader. You are an amazing trailblazer! Don't you ever forget it! Happy birthday! Happy birthday! Don't think about the road traveled. Look forward to the byways and highways ahead. The best part of your journey is yet to come. Enjoy the ride and, every once and awhile, stop to enjoy the view. If you truly believe in yourself, everybody will believe in you too. I believe you have what it takes to succeed at anything. Happy birthday! Happy birthday! Let everybody else struggle with life's baby steps, You're a giant, so I know you have it in you to make great strides. I think the wish below is the most inspirational one here because it touches upon a certain sentiment. This is one of my top picks because it expresses a wonderful sentiment: no matter what you think of yourself, you are one of the special few who have something truly great to give the world. Some people have a special light in them that illuminates this world. 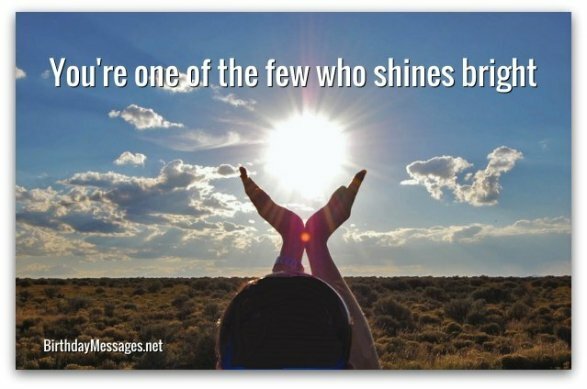 When in doubt or despair, read this message and know that I think you're one of the special few who shines bright. Happy birthday! Throw away the sails on your birthday and let the winds of change take you into the unknown. Life is more of an adventure when you venture out of your comfort zone. Happy birthday! Stay brave, positive and upbeat every day — and let your dreams and wisdom be your guide! Happy birthday! A wonderful life awaits you. A life full of joy, love and prosperity. You have so much potential and truly deserve life's best (even if you don't think so). Happy birthday! On your birthday, may you have the wind in your sails to stand up to life’s toughest storms and coast through every beautiful, sunny day. Happy birthday! At your age, you begin to learn so much about true love and real joy. Rest assured you will have the time of your life discovering both of them. Happy birthday! Hoping you grow up to be a wise person. You're already a fabulous person. Stay as amazing as you are and keep making the world a better place. Happy birthday! May all your dreams take flight when you're ready to fly! This birthday could be the beginning of this journey! I hope so! You've seen, heard and done so much for someone your age. Wishing you more of everything that fulfills you and gives you purpose. Carry on! Happy birthday! Every passing year brings new experiences and renewed hope for tomorrow. May you have an eternity of both. Happy birthday!